One of the best experiences that don’t cost a thing yet deliver so much goodness to your overall physical and emotional health, is a weekly touch with Mother Nature. I’ve made it a task of mine to incorporate at least one camping or hiking trip a month, since with Matthew being still very young I can’t really neglect my mummy and housewife duties that often. A secret between us: I so will when he’s old enough to be left alone at home and he’s able to take care of himself. I mean, life is just too short not to do it, right? Anyway, this weekend my parents happen to be free to look after Matthew, so I planned a hiking trip with Eliza and our husbands. Hiking is fun, it is a great bonding activity, but if you’re not properly prepared for it, you’ll find it rather exhausting, painful and well, scary. You see, this beautiful warm, sunny weather we have in Australia now doesn’t only awake all colours of nature’s rich flora, it also awakens some good-looking, but rather dangerous fauna as well. Snakes. I’m talking about the reptile with skin that shines from far and thus is the praised material of many highly-expensive brands of handbags and shoes. As much as I am against animals being used for producing other commercial goods, I won’t lie: some of these things are pretty good-looking. However, when one of these praised serpents cuts your way on the hiking trail, you won’t be thinking about your animal liberation fight – you’ll look for a way to save yourself. And this brings me to my point: you need to be fully prepared when you go hiking: from womens hiking boots to machetes and headlights. Naturally, machetes aren’t my thing; I left this part to my husband, so he’s going to take care of it. 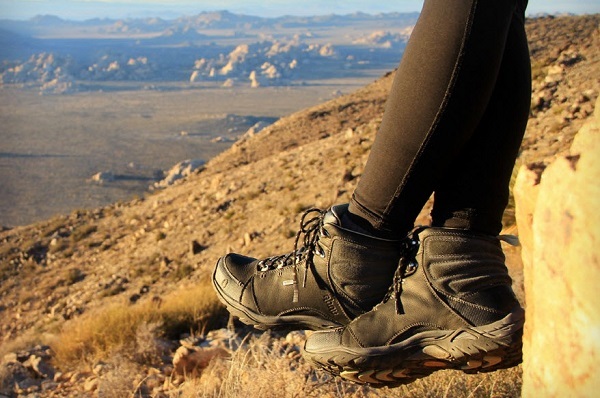 I took the obligation to explore the shoes – womens hiking boots, to be precise. Me and Eliza decided we’re going to buy these womens hiking boots because we believe that it’s always better to have a layer extra on your legs for protection. Yes, running shoes are great, but they don’t cover your entire leg, just the foot. And we’re not that brave. So, research mode is on and here are a few tips that can make hiking boots shopping a lot easier. First of all, let’s make the very important difference: hiking boots are not mountaineering boots. The latter are heavy, whereas hiking boots are a lighter version. You’d be walking a lot in them, so naturally they should be comfortable, not a burden to your feet. Normally, rough terrains, longer hiking trails and backpacking with a lot of heavy load would be the ideal preconditions for putting on hiking boots. Besides being lightweight, this type of boots offers a lot of stability, which is something you’ll need in conditions like the afore mentioned. Now, you may come across the eternal debate: why would you bother with the extra load of wearing boots, when you can wear running shoes? For a few reasons, actually. Hiking boots provide strong stability and ankle support, which running shoes don’t. You won’t be going hiking just so you can damage your feet. You want to enjoy and build strength, not injure yourself. Then, there is the danger of snakes. Just the mere thought of it gives me the chills. Actually it wasn’t until my husband found a snake in our backyard that I really developed this immense fear of snakes. They really look scary with their eyes and little poisonous tongues out. You can never know where they’re lurking from, and as much as you want to be heroic, when a snake instantly rushes towards you, you’ll get scared. What’s worse, sometimes you won’t even see it! Hiking boots that reach somewhere bellow your knees protect your legs and add an extra layer of material on top of your pants. And finally, as we’re ladies, being all dirty even when hiking, isn’t exactly our favourite look. Running shoes and sandals may be good for walks in the park or the nearby hills in dry summer season, but when the trails become wet and muddy, you’ll want to have boots to minimize the mess. So all in all, hiking requires preparation. It largely depends on the trails and route you choose, which is something you should examine way before you leave for the trails. However, dangers are always out there and when you think about the fact that you’d be alone in the middle of nowhere, you’ll want to have the best protection possible in any aspect.